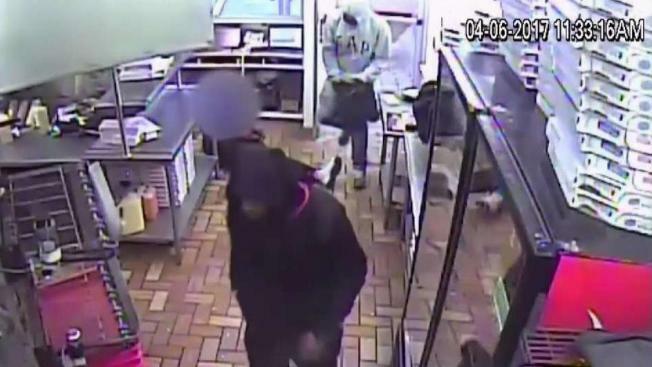 Two men robbed three Maryland businesses in just 30 minutes last year, but the GPS on one of the items they stole quickly led police to them. Surveillance video released to the News4 I-Team showed two men armed with automatic guns smashing through doors to get into the businesses and threatening workers in April 2017. Three customers at a Domino’s Pizza quickly exit the business when they realize what is taking place. The men also robbed a game store, taking PlayStation 4 devices, virtual reality headsets and Xboxes. One of those Xboxes had a GPS tracker, which helped lead police to the crooks in 20 minutes. Nathan Latimore pleaded guilty, and last week, a jury convicted James Thomas. Thomas also was charged with intimidating a witness — trying to prevent the witness from testifying at trial.